Pluto discoverer Clyde Tombaugh could only dream of a spacecraft flying past the small planet he spotted on the edges of the solar system in 1930. Yet the newest views of Pluto from NASA's approaching New Horizons probe – released today, on the late American astronomer's birthday – hint at just how close that dream is to coming true. Tombaugh, who died in 1997, was born on Feb. 4, 1906. "This is our birthday tribute to Professor Tombaugh and the Tombaugh family, in honor of his discovery and life achievements — which truly became a harbinger of 21st century planetary astronomy," said New Horizons Principal Investigator Alan Stern, from the Southwest Research Institute, Boulder, Colorado. "These images of Pluto, clearly brighter and closer than those New Horizons took last July from twice as far away, represent our first steps at turning the pinpoint of light Clyde saw in the telescopes at Lowell Observatory 85 years ago, into a planet before the eyes of the world this summer." The new images, taken with New Horizons' telescopic Long-Range Reconnaissance Imager (LORRI) on Jan. 25 and Jan. 27, were the first acquired during the spacecraft's 2015 approach to the Pluto system, which culminates with a close flyby of Pluto and its system of moons on July 14. New Horizons was more than 126 million miles (203 million kilometers) away from Pluto when it began taking the photos, which show Pluto and largest moon, Charon. 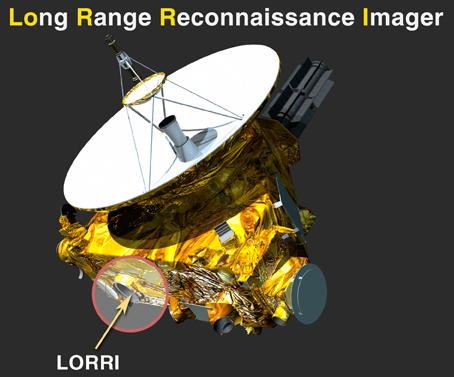 The "eagle eyes" of New Horizons, LORRI is a panchromatic high-magnification imager, consisting of a telescope with an 8.2-inch (20.8-centimeter) aperture that focuses visible light onto a charge-coupled device. It's essentially a digital camera with a large telephoto telescope – only fortified to operate in the cold, hostile environs near Pluto. Read more. "Pluto is finally becoming more than just a pinpoint of light," said Hal Weaver, New Horizons project scientist at the Johns Hopkins University Applied Physics Laboratory (APL) in Laurel, Maryland. "LORRI has now resolved Pluto, and the dwarf planet will continue to grow larger and larger in the images as New Horizons spacecraft hurtles toward its targets. The new LORRI images also demonstrate that the camera's performance is unchanged since it was launched more than nine years ago." 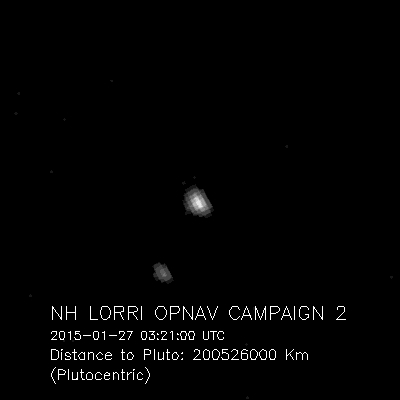 A Long Distance Look from LORRI:Pluto and Charon, the largest of Pluto's five known moons, seen Jan. 25 and 27, 2015, through the telescopic Long-Range Reconnaissance Imager (LORRI) on NASA's New Horizons spacecraft. New Horizons was about 126 million miles (203 million kilometers) from Pluto when the frames to make the first image were taken; about 1.5 million miles (2.5 million kilometers) closer for the second set. These images are the first acquired during the spacecraft's 2015 approach to the Pluto system, which culminates with a close flyby of Pluto and its moons on July 14. Pluto and Charon subtended 2 pixels and 1 pixel, respectively, in LORRI's field of view. The image was magnified four times to make Pluto and Charon more visible, though during the next several months, the apparent sizes of Pluto and Charon, as well as the separation between them, will continue to expand in the LORRI images. The image exposure time was only a tenth of a second, which is too short to detect Pluto's smaller moons. LORRI will also be taking images with longer exposure times (10 seconds) that should reveal both Nix and Hydra. See the individual images from Jan. 25 and Jan. 27. Over the next few months, LORRI will take hundreds of pictures of Pluto against star fields to refine the team's estimates of New Horizons' distance to Pluto. As in these first images, the Pluto system will resemble little more than bright dots in the camera's view until late spring, but mission navigators will use these images to design course-correcting engine maneuvers that precisely aim New Horizons on approach. The first such maneuver based on these "optical navigation" images, or "OpNavs," is scheduled for March 10. Closing in on Pluto at about 31,000 miles per hour, New Horizons has already covered more than 3 billion miles since launch on Jan. 19, 2006. Its epic journey has taken it past each planet's orbit from Mars to Neptune in record time, and it is now in the first stage of an encounter with Pluto that includes long-distance imaging as well as dust, energetic particle and solar wind measurements to characterize the space environment near Pluto. "My dad would be thrilled with New Horizons," said Annette Tombaugh, Clyde Tombaugh's daughter, of Las Cruces, New Mexico. "To actually see the planet that he had discovered and find out more about it, to get to see the moons of Pluto ... he would have been astounded. I'm sure it would have meant so much to him if he were still alive today." APL manages the New Horizons mission for NASA's Science Mission Directorate in Washington. Alan Stern, of the Southwest Research Institute (SwRI), headquartered in San Antonio, is the principal investigator and leads the mission. SwRI leads the science team, payload operations, and encounter science planning. New Horizons is part of the New Frontiers Program managed by NASA's Marshall Space Flight Center in Huntsville, Alabama. APL designed, built and operates the spacecraft. Click here to see the imaging distances in kilometers. Six Months of Separation: A comparison of images of Pluto and its large moon Charon, taken in July 2014 and January 2015. Between takes, New Horizons had more than halved its distance to Pluto, from about 264 million miles (425 million kilometers) to 126 million miles (203 million kilometers). Pluto and Charon are four times brighter than and twice as large as in July, and Charon clearly appears more separated from Pluto. These two images are displayed using the same intensity scales. In LORRI's current view, Pluto and Charon subtend just 2 pixels and 1 pixel, respectively, compared to 1 pixel and 0.5 pixels last July. The images were magnified four times to make Pluto and Charon more visible. Both images were rotated to show the celestial north pole at the top.